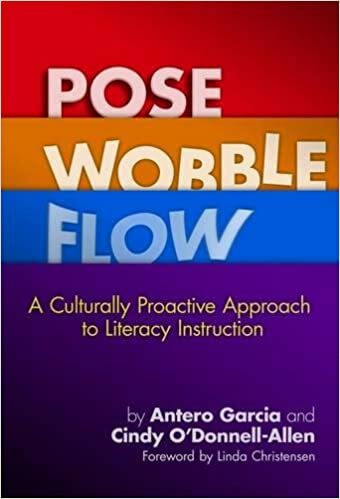 I’m thrilled to share that my newest, co-authored book, Pose, Wobble, Flow: A Culturally Proactive Approach to Literacy Instruction is out next week from Teachers College Press! My brilliant co-author, Cindy O’Donnell-Allen, and I wrote Pose, Wobble, Flow as a book for current and pre-service teachers in English classrooms. Considering the feelings of burnout, frustration, and stagnation that may come in waves in one’s career, I see the model at the center of this book as one that supports teachers across their careers. From looking at the civic responsibilities of teachers (both in and out of their classrooms), our role as curators, and the need to “hack” the content standards we engage with today, this is a hands on book that we wrote to think about what do teachers need now and in the future. Did I mention that Linda Christensen wrote an amazing (amazing!) foreword to the book? She did! Did I mention that some of the smartest educators and researchers that Cindy and I know share knowledge throughout, including Nicole Mirra, Bud Hunt, Danielle Filipiak, and Mark Gomez? They Do! Did you know that both Sonia Nieto and Bob Fecho write amazing things about this book that you can read on the back of the cover? Hell yes, they do! Did you know you can read a sample chapter through (co-publishers) the National Writing Project, right here? Do it! And did you know you can get a copy of the book online here (and of course you should harass your local bookstore and librarian!)? If that’s not enough, how about this hot-off-the-presses description from the back of the book? This book proposes a pedagogical model called ”Pose, Wobble, Flow” to encapsulate the challenge of teaching and the process of growing as an educator who questions existing inequities in schooling and society and frames teaching around a commitment to changing them. The authors provide six different culturally proactive teaching stances or ”poses” that secondary ELA teachers can use to meet the needs of all students, whether they are historically marginalized or privileged. They describe how teachers can expect to ”wobble” as they adapt instruction to the needs of their students, while also incorporating new insights about their own cultural positionality and preconceptions about teaching. Teachers are encouraged to recognize this flexibility as a positive process or ”flow” that can be used to address challenges and adopt ambitious teaching strategies like those depicted in this book. Each chapter highlights a particular pose, describes how to work through common wobbles, incorporates teacher voices, and provides questions for further discussion. Pose, Wobble, Flow presents a promising framework for disrupting the pervasive myth that there is one set of surefire, culturally neutral ”best” practices. As the online appendices gets uploaded shortly, I will be sharing additional info about the book, including places that Cindy and I will be hosting workshops and presentations related to the book. If you can’t tell, I am really excited about this book: I think Cindy and I are presenting a model of teacher support and education that reflects our beliefs about how English classrooms today can transform society. I hope you’ll take a look! Posted by antero on Wednesday, September 9, 2015, at 9:07 pm. Filed under clips, CSU, education, literacy. Follow any responses to this post with its comments RSS feed. You can post a comment or trackback from your blog. « Attend Our #SDCC15 Comics in the Classroom Workshop!